Märklin Magazin Annual Car in H0 for 2017, längd över buffertar 10,4 cm, epok IV. Prototype: Type F-z 120 (former Ommi 51) two-axle dump car. Privately owned car painted and lettered for the Märklin Magazin, Göppingen, Germany, used on the German Federal Railroad (DB). Hand brake and brakeman's platform included, rail clamps included. The car looks as it did around 1990. 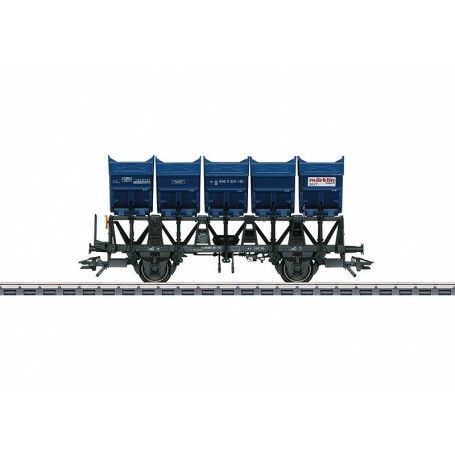 Model: The car is detailed with a partially open frame, separately applied rail clamps, and separately applied dump hoppers. The car also has a separately applied brakeman's platform. Length over the buffers 10.4 cm / 4-1/8'. DC wheel set E700580.